Madagascar; widely naturalized in tropics around the world (eFloras.org); Zimbabwe (Flora of Zimbabwe). Widely naturalised in, particularly in the coastal districts of eastern Australia. Common in eastern Queensland and the coastal districts of eastern New South Wales. Also naturalised in south-western and western Western Australia, in south-eastern South Australia, in southern Victoria, on Lord Howe Island and on Norfolk Island. Naturalised overseas in southern Europe, southern Africa, New Zealand, southern USA and on several Pacific islands (Weeds of Australia Biosecurity Queensland Edition). Flora of Zimbabwe (0). Flora of Zimbabwe. Madagascar; widely naturalized in tropics around the world (eFloras.org); Zimbabwe (Flora of Zimbabwe). Widely naturalised in, particularly in the coastal districts of eastern Australia. Common in eastern Queensland and the coastal districts of eastern New South Wales. Also naturalised in south-western and western Western Australia, in south-eastern South Australia, in southern Victoria, on Lord Howe Island and on Norfolk Island. Naturalised overseas in southern Europe, southern Africa, New Zealand, southern USA and on several Pacific islands (Weeds of Australia Biosecurity Queensland Edition). Overlaps with climates in south Africa and southern Europe, as well as Arizona, and coastal and riparian habitats in California (Cal-IPC). Prohibited noxious weed in AZ and noxious weed in Arkansas (USDA-NRCS PLANTS). I. indica is a weed in New Zealand and Hawaii. Blue morning glory (Ipomoea indica) is a significant environmental weed in Queensland, New South Wales and Victoria, and an environmental weed in South Australia and Western Australia. It was also recently listed as a priority environmental weed in at least one Natural Resource Management region (Weeds of Australia Biosecurity Queensland Edition). Ipomoea indica is a problem weed in Europe, southern Africa, and Oceania (congeneric WRA: Weed Risk Assessment for Ipomoea biflora (L.) Pers. (Convolvulaceae) – Bell vine). Invasive in Australia, New Zealand, China, Taiwan, and tropical islands throughout the world (PIER). It has become a noxious weed and invasive species in Australia, New Zealand, South Africa, California and Portugal (Wikipedia). Plant Epidemiology and Risk Analysis Laboratory, USDA Animal and Plant Health Inspection Service (APHIS), Center for Plant Health Science and Technology, Plant Protection and Quarantine (2015). Weed Risk Assessment for Ipomoea biflora (L.) Pers. (Convolvulaceae) – Bell vine . Prohibited noxious weed in AZ and noxious weed in Arkansas (USDA-NRCS PLANTS). I. indica is a weed in New Zealand and Hawaii. 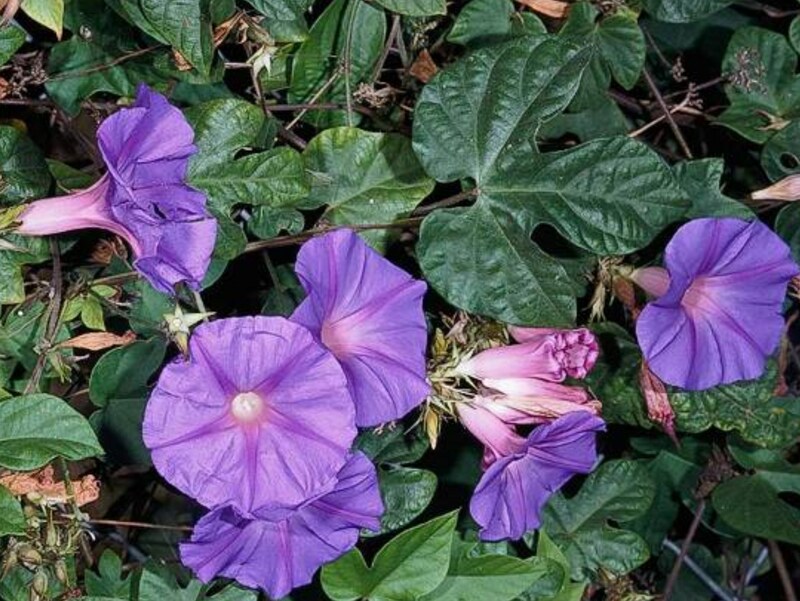 Blue morning glory (Ipomoea indica) is a significant environmental weed in Queensland, New South Wales and Victoria, and an environmental weed in South Australia and Western Australia. It was also recently listed as a priority environmental weed in at least one Natural Resource Management region (Weeds of Australia Biosecurity Queensland Edition). Ipomoea indica is a problem weed in Europe, southern Africa, and Oceania (congeneric WRA: Weed Risk Assessment for Ipomoea biflora (L.) Pers. (Convolvulaceae) – Bell vine). Invasive in Australia, New Zealand, China, Taiwan, and tropical islands throughout the world (PIER). It has become a noxious weed and invasive species in Australia, New Zealand, South Africa, California and Portugal (Wikipedia). Per unidentified reviewer: It is incorrect to say that it's a noxious weed in California. See https://www.cdfa.ca.gov/plant/ipc/encycloweedia/weedinfo/winfo_table-sci.... I don't trust Wikipedia as a reference for species being noxious weeds as I've found wrong information in it before. Noxious weed is a specific legal term (unlike invasive), so use either the USDA Plants database or the California noxious weed list to confirm that it is noxious. You have enough other evidence that this change will not affect the score for the question. Its congener, I. congesta, is listed as a weed in Taiwan, Hawaii, New Zealand, West Polynesia and the USA. Thirteen invasive congeners recorded in Queensland are I. alba, I. batatas, I. cairica, I. carnea subsp. fistulosa, I. hederaceae, I. hederifolia, I. nil, I. ochracea, I. pestigridis, I. purpurea, I. quamoclit, I. triloba. I. alba (moon flower) and I. quamoclit (cypress vine or morning glory) are listed as potential environmental weeds in Australia (Weeds of Australia Biosecurity Queensland Edition). I. biflora is considered potentially invasive in the U.S. (Weed Risk Assessment for Ipomoea biflora (L.) Pers. (Convolvulaceae) – Bell vine). Generally found in humid and subhumid forests, coastal habitats, riverine vegetation, disturbed sites, anthropogenic habitats (eFloras; Flora of Zimbabwe). I. indica is widespread in the tropical Pacific, the Americas, Asia and Africa. Preferred climate ranges from tropical to warm temperate (Auckland Regional Council 1998). It is quite susceptible to frosts (Weeds of Australia Biosecurity Queensland Edition). Grows best in USDA Zones 9-11; already present in California (Dave's Garden). Globally distributed worldwide (iNaturalist). I. indica is an opportunistic coloniser of open, disturbed habitats. Under favourable conditions of full sun, ample moisture and fertile soil it can grow very rapidly, smothering all other vegetation. Its climbing habit enables it to compete successfully with trees and shrubs on the edges of forests and along riparian zones. Its rapidly growing stolons can form dense mats over the ground. In Queensland, I. indica exists as isolated, small populations scattered along the east coast of Queensland. One of the largest infestations exists on a hillside near Montville/Maleny in coastal south-east Queensland. There is no evidence that I. indica is having an impact on primary production and suggestions that is poses a significant threat to native vegetation are largely speculative. I. indica prefers highly disturbed habitats where the original native vegetation has been fragmented or totally destroyed. For this reason, its environmental impact is probably limited. At some locations, it might be hindering regeneration of native plants and there is little doubt that it can smother native plants on the edges of rainforests. Perhaps most importantly, large areas of I. indica have dramatic visual impact, particularly in the Maleny region which is heavily promoted as a tourist destination. A long-lived (i.e. perennial) twining climber growing up to 15 m high, but sometimes scrambling over low vegetation or creeping along the ground. Blue morning glory's thick, smothering growth is a common sight on many rural roadsides and forest edges. Climbs high into canopies of native vegetation. Creates significant shading hazard for other species. Twining stems choke adjacent seedlings and smother mature plants (Weeds of Australia Biosecurity Queensland Edition). This perennial morning glory has vivid blue flowers over a long season (plants can be seen on an arbor near Dos Coyotes restaurant in south Davis) (Cardoons and other alien invaders). Shor, D. (2008). Cardoons and other alien invaders. An exhaustive Google/Google Scholar search did not reveal any evidence of fire promotion or changes to fire regimes, and this defaults to a "no" answer. It appears to be rare in areas that are subject to constant grazing by cattle but can thrive soon after stock are removed from a pasture (Weeds of Australia Biosecurity Queensland Edition). Seeds a major toxin (CalFlora). An exhaustive Google/Google Scholar search did not reveal any additional evidence of health risk or impacts to grazing systems, and this defaults to a "no" answer. While this plant can climb and smother other vegetation, an exhaustive Google/Google Scholar search did not reveal any evidence of formation of thickets that block passage, and this defaults to a "no" answer. This plant reproduces vegetatively via rooting stems and can sometimes also produce seed (outside Australia and New Zealand) (Weeds of Australia Biosecurity Queensland Edition). Cut stems resprout vigorously (PIER). I. indica reproduces primarily from broken fragments of stems that produce new roots at the nodes (Weeds of Australia Biosecurity Queensland Edition). I. indica does not produce viable seeds in Australia. Similarly, seed production in New Zealand is rare. The few seeds that are produced are mainly spread by water (Weeds of Australia Biosecurity Queensland Edition). Does not produce viable seed (Dave's Garden). In California, spreads by seed as well as by rooting everywhere it touches the ground (California Gardens). Though it scarcely ever reseeds, a single plant can engulf anything nearby to about a 30 foot distance (Cardoons and other alien invaders). There are some morning glory species which are strictly annual (e.g. I. nil), producing many seeds, and some perennial species (e.g. I. indica) which are propagated by cuttings (Wikipedia). Very little evidence was found of seed production being the primary mode of reproduction for this plant, even in California, and this defaults to a "no" answer. California Gardens (2015). California Gardens. Once established, it produces large numbers of flowers for most of the year. New flowers open each day fading to pink by late afternoon. I. indica does not produce viable seeds in Australia. Similarly, seed production in New Zealand is rare. The few seeds that are produced are mainly spread by water (Weeds of Australia Biosecurity Queensland Edition). In California, spreads by seed as well as by rooting everywhere it touches the ground (California Gardens). Though it scarcely ever reseeds, a single plant can engulf anything nearby to about a 30 foot distance (Cardoons and other alien invaders). There are some morning glory species which are strictly annual (e.g. I. nil), producing many seeds, and some perennial species (e.g. I. indica) which are propagated by cuttings (Wikipedia). Per Dave's Garden, does not produce viable seed. Very little evidence was found of seed production being the primary mode of reproduction for this plant, even in California, and this defaults to a "no" answer. No; does not generally produce viable seed (see questions 13-14). No; does not generally produce viable seed (see questions 13-15). Flowers year-round in most countries (eFloras). Once established, it produces large numbers of flowers for most of the year. New flowers open each day fading to pink by late afternoon (Weeds of Australia Biosecurity Queensland Edition). However, this is a "no" because this plant does not generally produce viable seed (see questions 13-16). Stem fragments are commonly spread by water, animals and in dumped garden waste (Weeds of Australia Biosecurity Queensland Edition). I. indica does not produce viable seeds in Australia. Similarly, seed production in New Zealand is rare. The few seeds that are produced are mainly spread by water. Stem fragments are commonly spread by water, animals and in dumped garden waste (Weeds of Australia Biosecurity Queensland Edition). I. indica reproduces primarily from broken fragments of stems that produce new roots at the nodes. Hence, the most common mode of dispersal is believed to be as a consequence of gardeners dumping unwanted vegetative material. Stem fragments are commonly spread by water, animals and in dumped garden waste (Weeds of Australia Biosecurity Queensland Edition). Reviewed by Elizabeth Brusati (edbrusatic@cal-ipc.org, Cal-IPC) and Tim Hyland (tim.hyland@parks.ca.gov, CA State Parks). Added a note to Q4; nothing else changes.